Alcohols are organic (carbon-containing) compounds derived from hydrocarbons (organic compounds composed of only carbon and hydrogen). They are formed by replacing the hydrogen atoms in their parent hydrocarbons with one or more hydroxyl groups. Each hydroxyl group (–OH) is made up of one atom of oxygen and one atom of hydrogen and is referred to as a functional group. Functional groups generally determine how a molecule will behave. 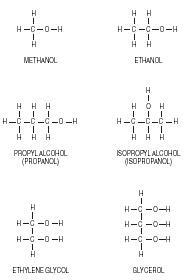 Alcohols with one hydroxyl group include methanol, ethanol, and propanol. Alcohols are named from their parent hydrocarbon by substituting the suffix -ol for the final -e. For example, ethane becomes ethanol, methane becomes methanol, and propane becomes propanol. The lower an alcohol's molecular weight (determined by the number of carbon atoms), the more soluble it is (or the easier it can be dissolved) in water. A greater number of hydroxyl groups (–OH) also increases water solubility because hydrogen bonds can form between the alcohol molecule and water. As the number of carbon atoms increases, hydrogen bonding is disturbed and solubility in water decreases. Hydrogen bonding is also a factor in the boiling points of alcohols. In this case, hydrogen bonds can form between hydrogen and oxygen atoms in adjacent molecules (molecules located next to each other). When alcohols are heated, the energy needed to break these bonds determines the boiling point. The more hydroxyl groups an alcohol molecule has, the higher its boiling point. Methanol. Methanol (methyl alcohol) is the simplest of the alcohols. Also known as wood alcohol, it was originally produced by heating hardwoods to high temperatures without air (called destructive distillation). Today, methanol is produced from natural gas or synthetically from synthesis gas. Synthesis gas is a mixture of carbon monoxide, hydrogen, and methane obtained when heated, crushed coal is treated with superheated steam in a process called coal gasification. Methanol occupies an important place in industry. It is used in the synthesis of organic chemicals such as formaldehyde (the basis for various polymers—compounds with repeating structural units), acetic acid, and methyl-t-butyl ether (MTBE, an additive that increases gasoline's oxygen content [the number used to measure the antiknock properties of a liquid motor fuel]). Methanol is also used as an antifreeze in windshield washer fluid. It can be utilized directly as a fuel to replace gasoline, but it evaporates quickly and its use requires major automobile engine modifications. This alcohol is extremely toxic and can cause poisoning and blindness if ingested. Ethanol. Ethanol (ethyl alcohol) is best known as the active ingredient in alcoholic beverages. It is produced by the fermentation (or chemical changes) of sugars and starches in fruits and some plants, using techniques that were developed thousands of years ago. In fact, ancient Egyptian papyrus scrolls exist with directions for making beer from dates and other food plants. During fermentation, glucose and other sugars from fruits, vegetables, honey, or grains such as barley are converted into alcohol through the action of yeast. Ethanol is also known as grain alcohol or simply as alcohol. Both beer (usually made from barley and flavored with hops) and wine (made from grapes and many other fruits) are products of the fermentation process. Alcohol: Any of the large number of molecules containing a hydroxyl (-OH) group bonded to a carbon atom to which only other carbon atoms or hydrogen atoms are bonded. Destructive distillation: An antiquated process of heating wood to high temperature in the absence of air to obtain small amounts of alcohols, particularly methanol. Distillation: The process of separating liquids from solids or from other liquids with different boiling points by a method of evaporation and condensation, so that each component in a mixture can be collected separately in its pure form. Fermentation: The action of microorganisms such as yeast on carbohydrates (sugars and starches), resulting in the conversion of sugar to alcohol and carbon dioxide. Hydroxyl group: The -OH group attached to a carbon atom in a molecule and the site of most chemical reactions; also called the functional group. Synthesis gas: A mixture of carbon monoxide and hydrogen gases obtainable both from coal and natural gas and used in the synthesis of alcohols and other organic compounds. The alcoholic content of a substance can be increased by distillation following fermentation. Distillation is accomplished by heating the liquid until it evaporates, then collecting the resulting vapor and returning it to a liquid state. Distillation of alcohol for medicine was established by the early twelfth century in Italy, where herbs and spices were added to the distilled product. It is believed that this practice led to the development of liqueurs such as Benedictine and Chartreuse. Later, other organic mixtures were fermented and distilled—wine into brandy, grain into whiskey, sugar mash into rum, and vodka from potatoes. Ethanol is one of the least toxic of the alcohols, but if enough is ingested in its pure form, poisoning and even death can occur. Ethanol is also very important in industry. It is used in the synthesis of many organic chemicals and as a solvent in the preparation of essences, tinctures, varnishes, and food extracts such as vanilla. In addition, it is used as an ingredient in perfumes, dyes, and as a skin antiseptic. Ethanol is produced for industrial use by chemically adding water to ethylene, a process called high-pressure hydration. Gasohol. Gasohol, a mixture of gasoline and up to 10 percent ethanol, has gained some acceptance as a fuel for automobiles. Adding ethanol to gasoline increases the oxygen content of the fuel, thus lowering carbon monoxide emissions from automobiles. It also raises the octane rating of the gasoline, causing smoother fuel performance. Gasohol is mainly produced using corn, which is fermented, and the fermentation products are then distilled to yield pure ethanol. Propanol. Propanol can exist in two forms, 1-propanol (n-propyl alcohol) and 2-propanol (isopropyl alcohol), because the –OH group can be attached either at the end or in the middle of the carbon atom chain. Isopropyl alcohol is the main ingredient in rubbing alcohol, an effective disinfectant. It is also widely used in industry as a solvent for paints and chemical processes. Ethylene glycol. Ethylene glycol, with two hydroxyl groups, is very water soluble and has a relatively high boiling point. Both these properties make it ideal for use as an antifreeze in automobiles. Glycerol. Glycerol (or glycerin) is a nontoxic, clear, syrupy liquid made from fats and oils. With its three hydroxyl groups, glycerol bonds well with water and has good moisturizing properties. It is used as an ingredient in soaps, skin lotions, and even foods. Glycerol is also used as a lubricant and in the manufacture of explosives. Thanks so much. Now i can tell my kids what to watch out for. I've been looking all over the internet and libraries and I couldn't find anything i was satisfied with. I am very pleased with this website and will tell all my friends to go on this website to find out what to look for.